ONLINE BIDS ARE NOW CLOSED !! who have donated such amazing Lots. We are truly grateful. 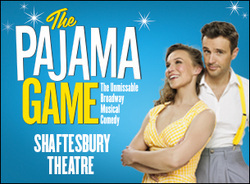 2 X Top Tickets for "The Pajama Game"
Kindly donated by The Old Vic Theatre. Richard Eyre’s critically acclaimed production of this classic Broadway musical. “An adrenaline rush of pure pleasure”. 2 x Top Tickets to The Pajama Game at the Shaftesbury Theatre on a date of your choosing from Monday to Friday until September 12th. Kindly donated by SpaceNK, Westbourne Grove. Pamper yourself or a best friend with a Signature Massage. An incredibly indulgent one hour and forty-five minutes of bliss. SpaceNK offers a unique selection of treatments in a relaxing, tranquil environment. Kindly donated by Eva Fraser. Eva is living proof that her methods do work. Eva Fraser - born 1928 - has inspired people all over the world to achieve a feeling of well being and confidence through her facial exercises and philosophy of life. Bid now for your one-to-one Starter Session. Unique opportunity! Job Shadow at Mulberry !!! Founded in 1971 by Richard Saul, Mulberry is considered one of the most iconic British fashion labels, noted for its leather poacher bags including the binocular bag and dispatch bag. Mulberry's range now includes womenswear, menswear, and most recently, footwear for women. You will follow a day in the life of the PA to brand director Anne-Marie Verdin. As well as observing many fascinating aspects of this exciting job, you might even bump into Cara Delevingne! Kindly donated by Laura Sevenus. Your baby will be treated to a 75 minute spa session, which includes a soothing and gentle flotation followed by an infant massage. For babies up to 6 mos. Kindly donated by Opera Holland Park. 2 top tickets to “Adriana Lecouvreur” – the sumptuously gorgeous opera by Francesco Cilea. August 1st, 5th, 7th, 9th at 7.30 pm. Situated on Kensington Church Street, Burlington's are specialist dry cleaners that offer a wide range of services including shirts, laundry, shoe repairs, suede and leather cleaning, invisible mending and tailoring alterations. They also offer a free collection and delivery service. Kindly donated by Johnny Irish MA VetMB MRCVS. A comprehensive consultation with the newly established practice on Kensington Church Street. Identify issues that might otherwise go unnoticed and make sure that all your pet’s healthcare needs are being addressed. This includes nutrition, internal and external parasite control, dental prophylaxis and weight check. Kindly donated by Amy Fanton. This lot comprises a 30 minute session of your choice – baby/child/family. It includes five 4x6 prints or a 8x10 print, and more can be ordered. Amy writes: “I go out of my way to make sure your family photo session is as relaxed and enjoyable as possible. We will laugh, skip, jump, and play our way through the family photo session and it will be a time for your family to connect with one another and do what you all enjoy doing. “ Sounds fun! Kindly donated by The Abingdon. 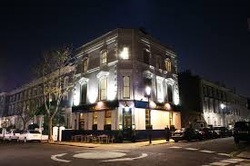 One of the finest and best loved restaurants in Kensington. You are bidding on dinner for four persons – excluding wine. The Life Centre is the start of something special – Yoga For Life. Choose five sessions from a wide range of classes – from Ashtanga Yoga to Pregnancy Pilates. Get an exclusive insight into the workings of this unique online fashion shop. 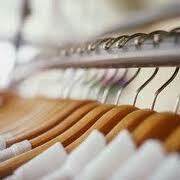 Chloe, Marc Jacobs, Burberry Prorsum, Miu Miu and Stella McCartney, and ships to 170 countries. Kindly donated by Louisa Snowsill. Award winning hairdresser, Louisa Snowsill, is offering the lucky winner a superb haircut and styling session at her salon on Kensington Church Street. Buy this to pamper yourself or give to a friend or someone in your family as a special present! Kindly donated by Recipease, Jamie Oliver. 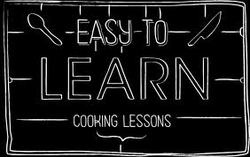 Introduce your kids to the art of cooking and help discover the next Jamie Oliver! And you might pick up a good tip or two, as all children need to be accompanied by an adult. You can use this voucher for one child for two separate sessions or two children (siblings or friends) attending the same session. Kindly donated by Ole Kids. The gift of learning Spanish. Choose either a term of group classes or two private classes. Kindly donated by Il Portico. Spanish 6 decades and three generations, Il Portico Restaurant on Kensington High Street has been cooking regional Italian specialities since it was first opened in the 1960’s by Pino Chiavarini. Still managed to this day by the same family, siblings James and Francesca draw heavily from their ancestors influence by providing simple, authentic Italian food from their home region of Emilia Romagna and beyond. Kindly donated by Brudenell Hotel. The Brudenell hotel and two AA Rosette Award Seafood Restaurant is a privately owned property located in Aldeburgh, Suffolk. Our wonderful seafront setting provides panoramic views of Aldeburgh’s shingle beach as well as beautiful views of the river Alde and the surrounding countryside. 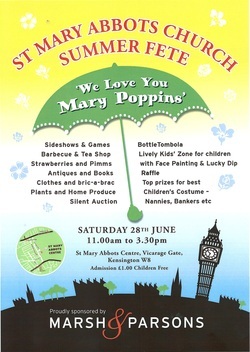 COME ALONG TO THE SUMMER FETE TO CONCLUDE BIDDING - LOTS MORE FABULOUS LOTS ON THE DAY , YOU ARE IN FOR A TREAT !! !